The Digital Research Library of Illinois History Journal™: Illinois becomes the 21st State of the Union on December 3, 1818. Illinois becomes the 21st State of the Union on December 3, 1818. Though Illinois presented unique challenges to immigrants unaccustomed to the soil and vegetation of the area, it grew to become a bustling and densely populated state. The strange but beautiful prairie lands east of the Mississippi and north of Lake Michigan presented a difficult challenge to the tide of westward-moving immigrants. Accustomed to the heavily forested lands of states like Kentucky and Tennessee, the early immigrants to Illinois did not know what to make of the vast treeless stretches of the prairie. Most pioneers believed that the fertility of soil revealed itself by the abundance of vegetation it supported, so they assumed that the lack of trees on the prairie signaled inferior farmland. Those brave souls who did try to farm the prairie found that their flimsy plows were inadequate to cut through prairie sod thickly knotted with deep roots. In an “age of wood,” farmers also felt helpless without ready access to the trees they needed for their tools, homes, furniture, fences, and fuel. 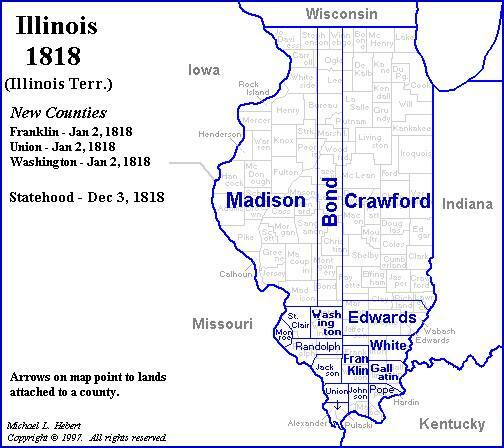 For all these reasons, most of the early Illinois settlers remained in the southern part of the state, where they built homes and farms near the trees that grew along the American Bottom. The challenge of the prairies slowed emigration into the region; when Illinois was granted statehood in 1818, the population was only about 35,000, and most of the prairie was still largely unsettled. Gradually, though, a few tough Illinois farmers took on the difficult task of plowing the prairie and discovered that the soil was far richer than they had expected. The development of heavy prairie plows and improved access to wood and other supplies through new shipping routes encouraged even more farmers to head out into the vast northern prairie lands of Illinois. By 1840, the center of population in Illinois had shifted decisively to the north, and the once insignificant town of Chicago rapidly became a bustling city. The four giant prairie counties of northern Illinois, which were the last to be settled, boasted population densities of 18 people per square mile. Increasingly recognized as one of the nation’s most fertile agricultural areas, the vast emptiness of the Illinois prairie was eagerly conquered by both pioneers and plows. Happy Birthday 🎂Illinois. .we have had 7 generations to live here..
Love history of Illinois. This article was fascinating! !